Prepare the content of your auto-responder email. Go to menu option "Admin" / "Setup" / "Auto Response email configuration". If you don't have an account yet, click here. Copy the content to the content editor & click Save. Get the signup link from menu: "Setup" / "Signup form". It should look like this: http://newsletter.ie/run/registercontact.aspx?mi=y∨gid=98750 - the number at the end, called OrgID, is unique to your Account. You can test the responder using this link before proceeding to the Twitter setup. 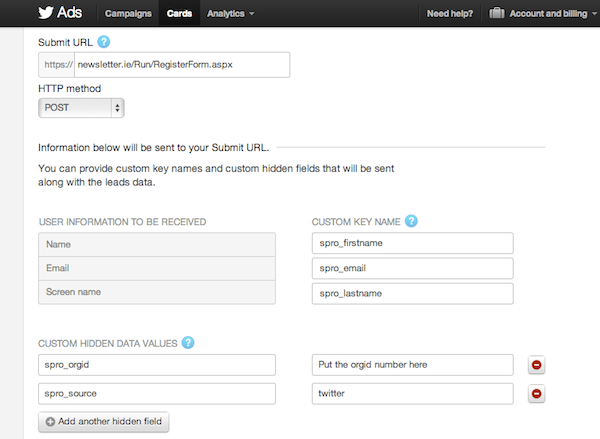 Now login to your Twitter Ads account and create a Lead generation card. In the Fallback URL use the link from Step 5 (ensuring that you use the correct "orgid" at the end). Test your card & you are ready to go! We are trusted by the world's top brands for email deliverability, shopper scoring and personalisation. Join the high open rate club by clicking the orange button below or contact us by using the details at the bottom of this page.